Thank you to everyone who weighed in on their favorite buffet here! Last week we went to go check out Buffet # 5 (aka the MadMen-true-50s-style-buffet). It has a really cool look but it is all drawers. We have a couple of large items (KitchenAid!) that need a safe spot within reach of the kitchen so all drawers isn’t ideal. The drawers were on old metal rollers which made them pretty sqeaky and difficult to open. A bit of WD-40 might be enough to fix the squeaks and skids but for $500 we weren’t willing to find out. 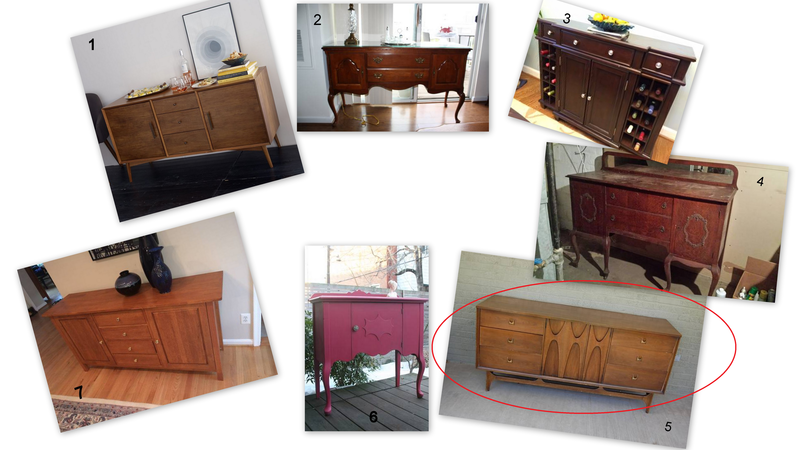 We also made a trip to see Buffet #1 (aka our inspiration) from West Elm. 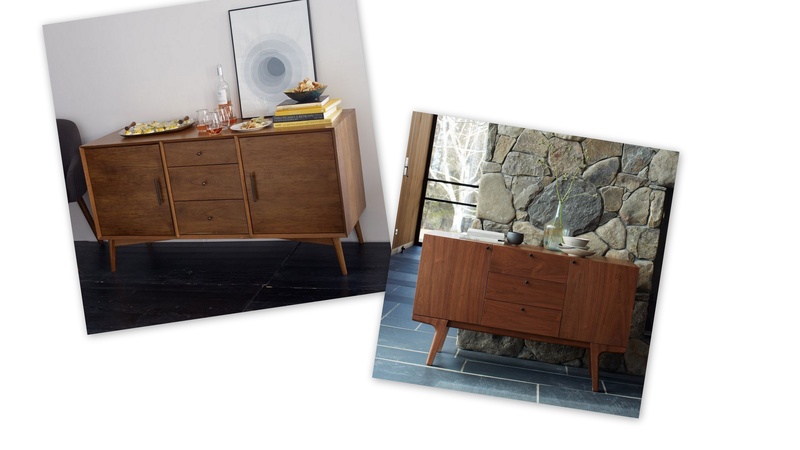 The store didn’t have a floor sample of the Mid-Century Buffet (above left) but did have the Dumont Buffet (on the right above). 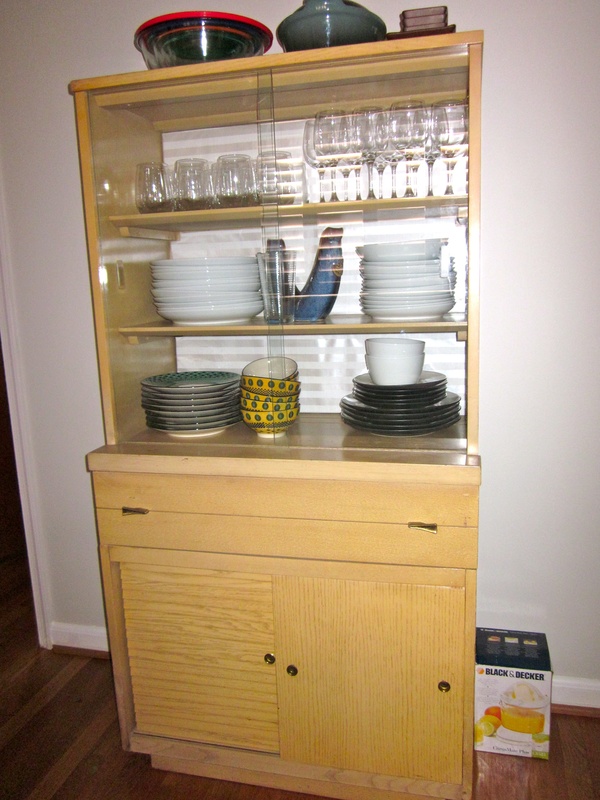 The Dumont gave us a pretty good idea of the quality and size we could expect (with the “Mid-Century Buffet” clocking in at 4 inches longer, 1.5 inches shorter, and 2 inches deeper). As expected we really liked the West Elm buffet but the $1025 price tag (price+delivery+shipping+taxes) convinced us to keep our options open. The last field trip we took was to see Buffet #7 (aka fan favorite and best storage). 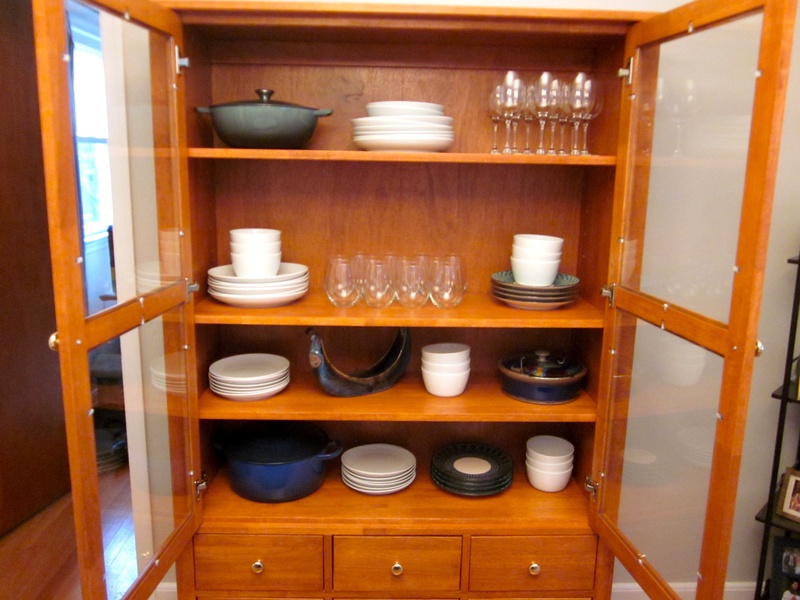 When we inherited our current hutch we knew it wouldn’t be a forever piece in our dining room. The blonde wood veneer isn’t our favorite. We considered painting or staining but we don’t love the shape either, which is much harder to manipulate. 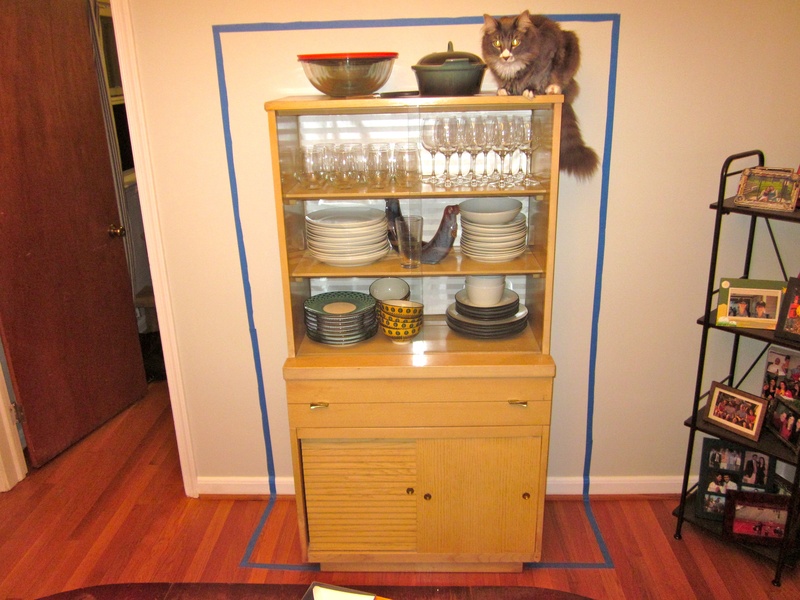 We might try to paint it a funky color and use it for a liquor cabinet…. or we might Freecycle it. Any suggestions? We knew we were serious about Buffet #7 before we even walked through the door so we came armed with measuring tape and a notepad. The buffet came in at 71 inches long, 35 inches tall, and 19 inches deep. 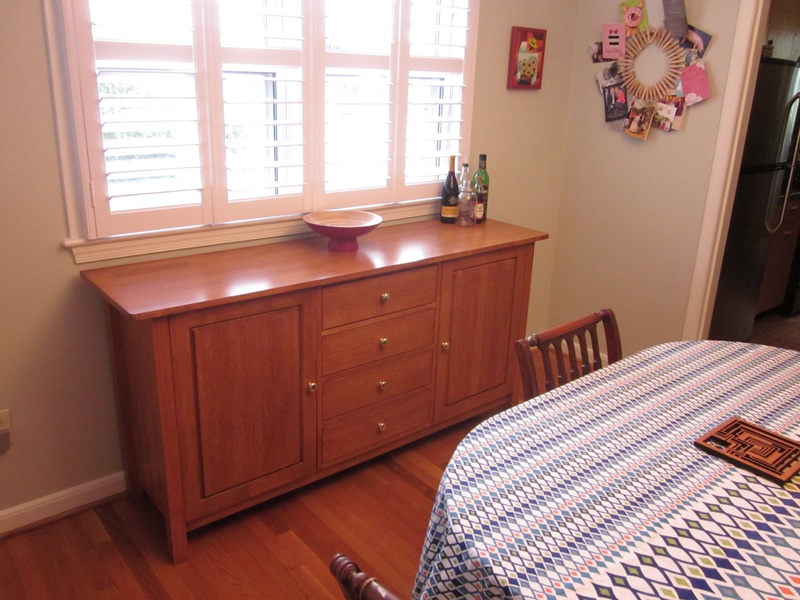 Both the buffet and hutch are a light cherry color and the drawers opened smoothly. We were even more impressed with the quality in person than the craigslist post had let on. Our one concern was that he buffet was HUGE, which is great for storage but possibly overkill for our little dining room. 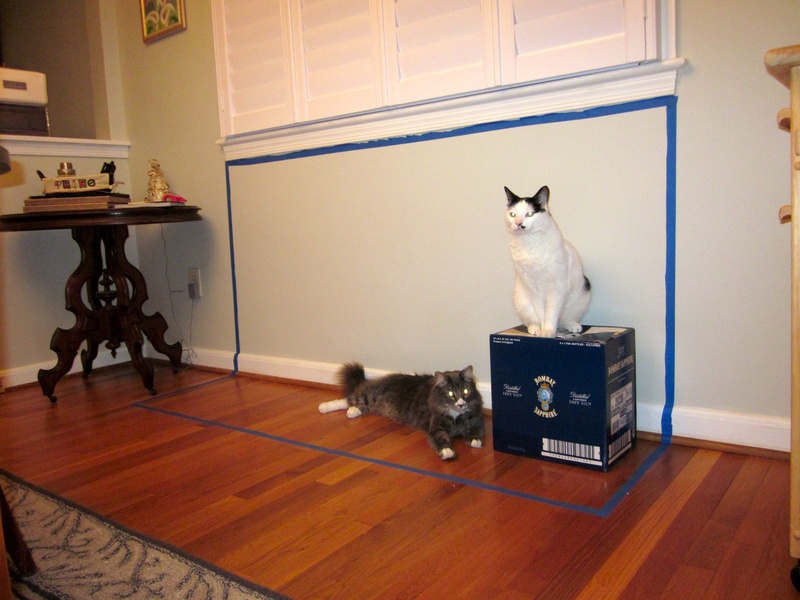 Once once we got home we taped off the walls and floor to see how they would fit our space. 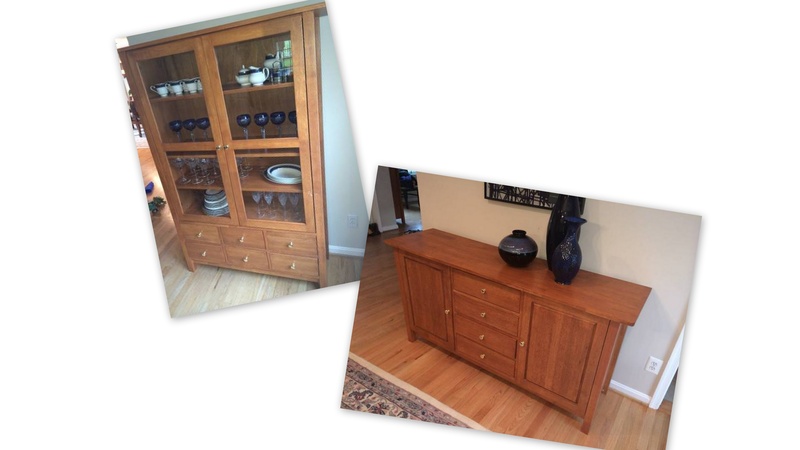 The asking price for both items was $350 but we knew from our craigslist search that our area is fully saturated with people trying to sell buffets. We offered $300. He accepted. 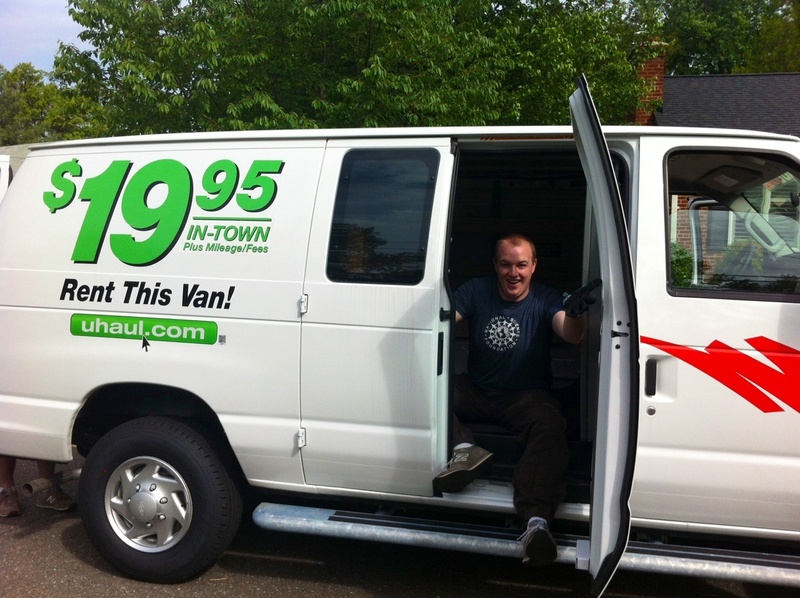 Our friend Jeff graciously volunteered agreed after much flattery and few details to help us move the furniture. Once you factor in Uhaul rental and gas we paid almost exactly $350- yes we are suckers and got the uhaul insurance. We were happy with the final price tag considering the runner up options were $500 and $1025. The way I see it we paid less for our buffet and got a bonus hutch! 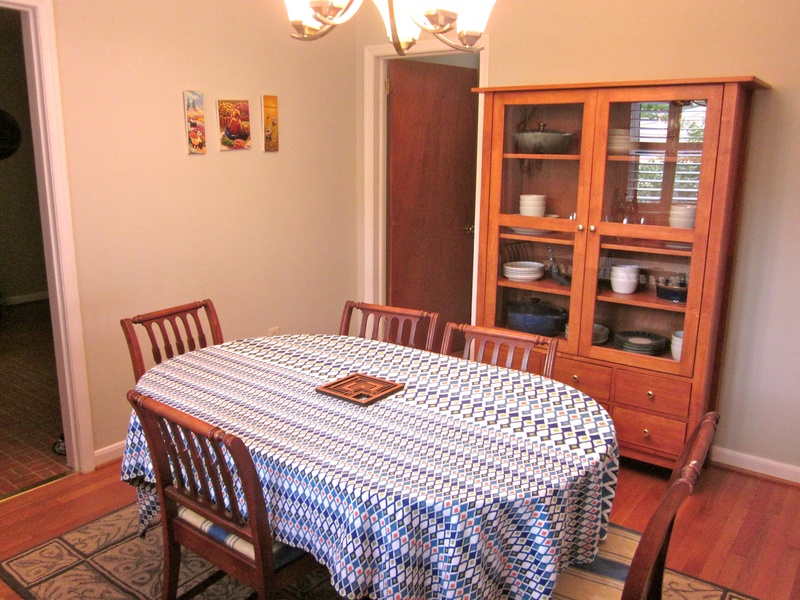 Here is how they look in the dining room! I’m so happy we no longer have our beautiful gifts on the floor! Claire, I’m loving your blog! I now check it everyday and can’t wait for new entries! Thanks Joanna!! Doesn’t everyone need a neon liquor cabinet? We aren’t quite sure where it will fit but it seems too fun not to try.